Giovonni Wade has lived in North Carolina most of her life. Originally from Fayetteville, North Carolina, she moved to Raleigh to attend North Carolina State University on a Park Scholarship, a full tuition merit scholarship. 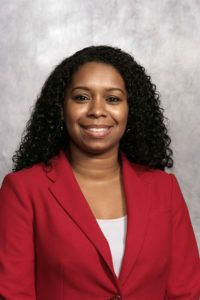 Ms. Wade graduated with honors from NC State and earned her Bachelor of Arts in both Psychology and English. She then attended the University of North Carolina School of Law where she earned her Juris Doctor. While at UNC, Ms. Wade served as a notes editor for the Journal of Law and Technology and was actively involved with the Black Law Students Association, Student Bar Association, and Honor Court. Prior to joining NCCU, Ms. Wade worked at Schwartz & Shaw, P.L.L.C., an education law firm in downtown Raleigh. She exclusively practiced education law and represented K-12 school boards throughout North Carolina in employment, contract, and bond forfeiture matters. She also chaired the North Carolina Bar Association’s Education Law Section, in addition to holding a seat on the executive board for a number of years, and served on the Minorities in the Profession Committee. She has also volunteered with the Law Day Committee of the Young Lawyers Division and the Wake County Bar Association’s Lunch with a Lawyer program.